Thomas was baptised at St Paul’s, Covent Garden on 7th March 1733/34. Thomas must have moved from London with his father to Panfield, Essex in the Spring of 1737 at the age of 3 - see notes on his father. He attended Bishops Stortford School, Hertfordshire under Mr Wall. He was admitted at Lincoln’s Inn on 25th January 1749/50 at the age of 16. A year later he was admitted to Trinity College, Cambridge on 29th January 1750/51. He matriculated and was a Scholar in 1751. Following Charlotte’s death in 1763, probably in childbirth, Thomas, widow, married Ann Jones, daughter of Thomas Jones, Esq at All Hallows, Tottenham High Road, High Cross, London, on 20th November 1766. The marriage was by Faculty Office Licence dated 16th February 1766. Ann and her family were from Bristol, Gloucestershire and Thomas was still of Lincoln’s Inn, but the Parish of St Giles in the Fields. In 1772 Thomas was a member of the Society for the Encouragement of Arts, Manufactures, and Commerce in London and his address was Chandos Street, Cavendish Square. In 1782 he bought "The Grove" in Whitham in Essex from Lord Paisley, 7th Earl of Abercorn. The Grove was advertised for sale in 1782 as "a suitable abode for a person of distinction, or by taking down some part thereof, may be made an exceeding good house for a private Gentleman" Thomas was then a lawyer of Lincoln's Inn, London. It is reported that Thomas and his family had their own bath house beside the River Brain; cold water bathing was then a fashionable pursuit. Thomas also paid extra Hairpowder Tax so that their children and their butlers could were wigs as well as Thomas. Sadly, The Grove was demolished in 1932. On 30th April 1794, Thomas, of The Grove, was appointed Treasurer of the County Meeting. Thomas died in Southampton Row, London on 13th May 1804 aged 70, and his residence was given as “The Grove, Witham” - Gentleman’s Magazine. He presumably still had a “town” house as well as his Estate in the country. He wished to be buried in “my vault” at Panfield, and mentioned property in Round Court, Strand and Lincoln’s Inn Fields. He referred to a marriage settlement with his “present wife” Ann. 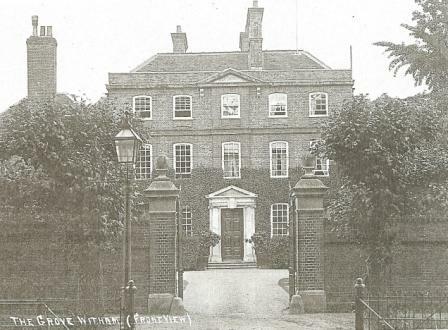 After her death, the house at Witham (Witham Grove) was to pass to his son Roger Kynaston. He mentioned his daughter Susanna and his son Charles Hayward Kynaston to whom he left money; also his daughter Mary, wife of Rev. William Groves. He mentioned money left to him by his late Uncle Samuel Torriano and Samuel’s wife Mary, and also referred to his “friend and kinsman” Rev. 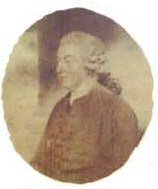 Thomas Spencer. In a codicil dated 28th March 1804, he referred to some items left to his daughter Elizabeth by his Aunt Judith - see The children of Thomas Kynaston (1665) & Mary Bailey notes. Various other references were made to trusts and two manors - Newland and Chipping in Witham, Essex. Baptism and marriage data come from the relevant Parish Records. Thomas Appears in list of members, [Society of Arts, 1772] A List of the Society for the Encouragement of Arts, Manufactures, and Commerce. London, January 23, 1772. [7400.d.96(2) Cambridge University Library], 1772, London. Printed by order of the Society. By W. Adlard and J. Browne, in Fleet-Street.